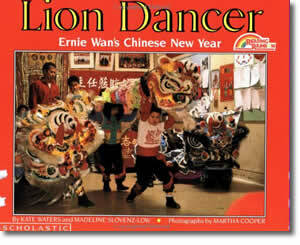 Describes six-year-old Ernie Wong's preparations, at home and in school, for the Chinese New Year celebrations and his first public performance of the lion dance. Ernie's father, a kung fu master, choreographs The Lion Dance, the center of the community celebration and a major tourist attraction. This year, Ernie dances in the place of honor under the lion's head. Color photographs depict private and public festivities.